Negligence in the garden is not often rewarded. Usually, when you turn your back for a week or two, you can expect to be confronted with produce past its prime (picture zucchinis the size of baseball bats) and weeds springing up in garden beds. Artichokes are an exception. When left unpicked, the edible buds open with spectacular 6-inch purple blooms. Native to the Mediterranean, artichokes are grown for their edible buds. To harvest the buds, wait until they form large, tight globes and cut along with a couple of inches of the stalk (also edible). But don’t wait too long to pick the crop. As soon as the buds open and the majority of the leaves splay outwards, you’ve basically missed the boat. Most of the leaves will be tough even after cooking. At this point, you’re better off just leaving the bud on the plant and letting it flower. And aren’t they stunning? Our artichokes in the Sunset Test Garden are bee and butterfly magnets. 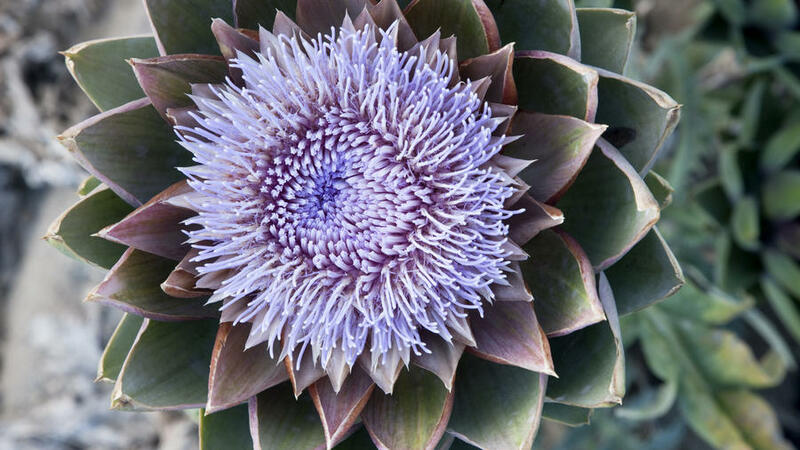 The thistle-like blooms open to 6-inches across and have almost iridescent lavender blue centers. Flowers can be cut for bouquets, dried for arrangements, or just left on the plant for a dramatic display. With this type of reward, more often than not we just let our plants go to flower and rely on the farmers’ market for artichokes for cooking.